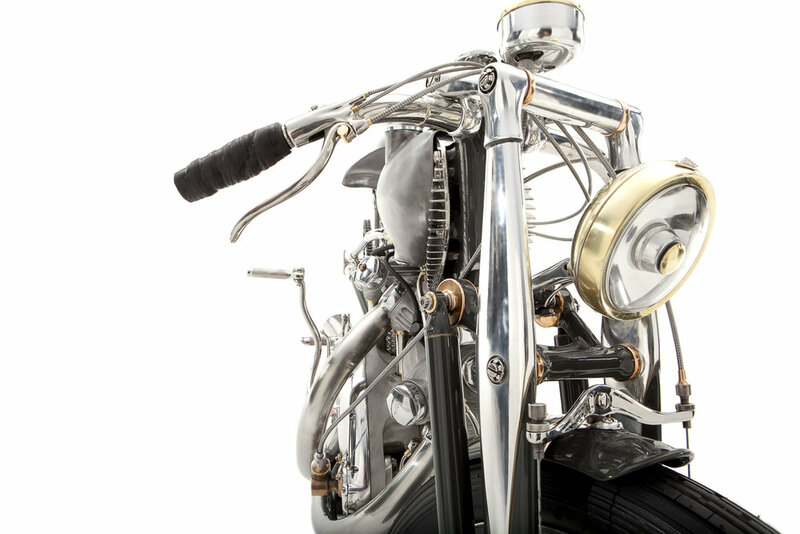 Acrylic, aluminum, brass, bronze alloy, copper, cloth, enamel, epoxy, glass, leather, LEDs, nickel, pyrex, rubber, silver, stainless mesh, stainless steel, steel, springs, titanium, white gold leaf, 1952 Vincent Black Shadow engine, Avon tires, Borrani 21” WM1 wheel, Borrani 20” WM2 wheel. 33 X 30 X 80IN. PLEASE CONTACT FOR INFORMATION ABOUT PURCHASING THE BLACK. An unfathomable amount of time and attention was spent on The Black's creation. 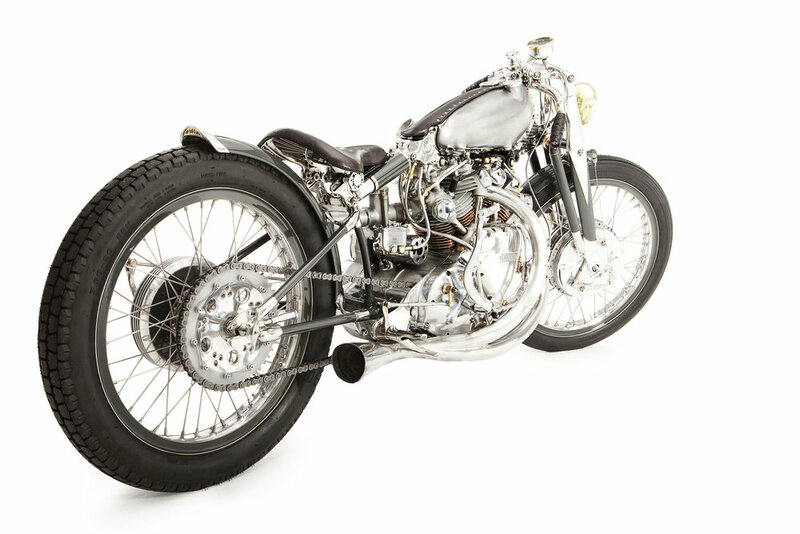 The Black’s chassis was fabricated in its entirety—barring a single small frame lug— at Ian Barry’s Los Angeles studio: frame, forks, brakes, tanks, handlebars, hand and foot controls, seat, and mudguards. 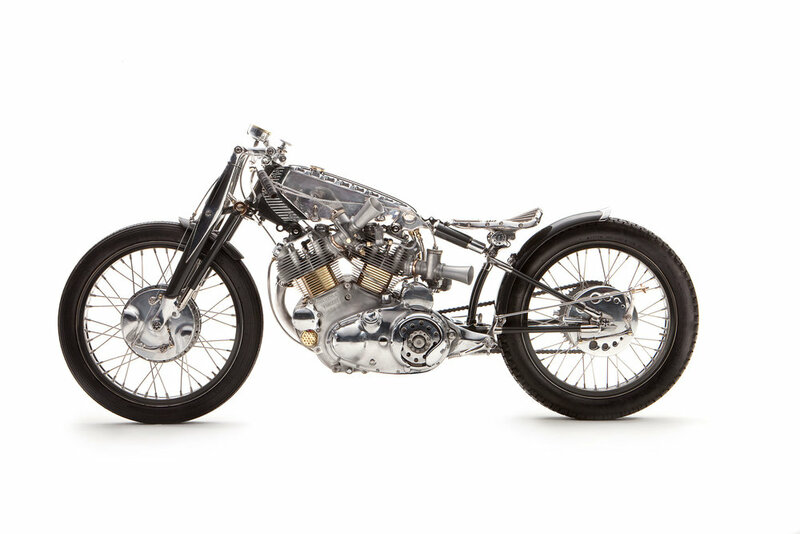 The Black engine is from a 1952 Vincent Black Shadow, widely considered one of the ‘top 10 best’ production motorcycles of all time, and “The World’s Fastest Standard Motorcycle” for over 25 years after its introduction in 1948. 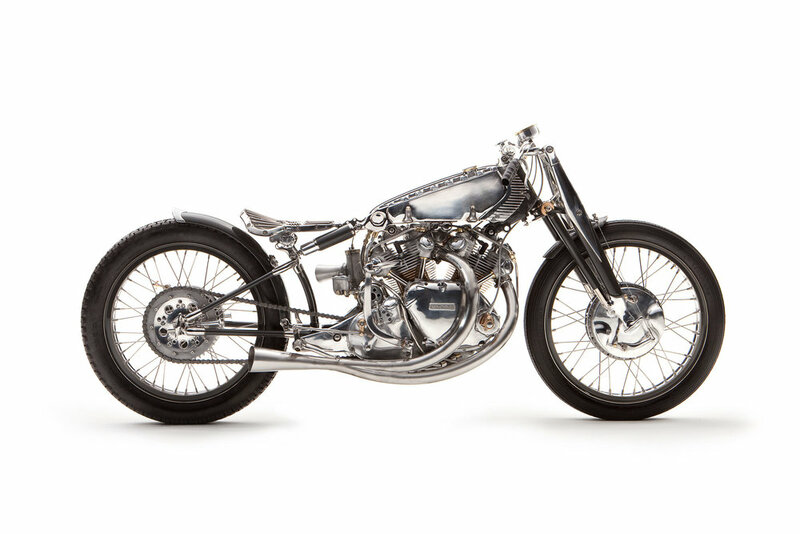 The starting point for The Black's engine was a 1952 Vincent Black Shadow, which had been heavily modified for dry lake racing at El Mirage in the 1960s. 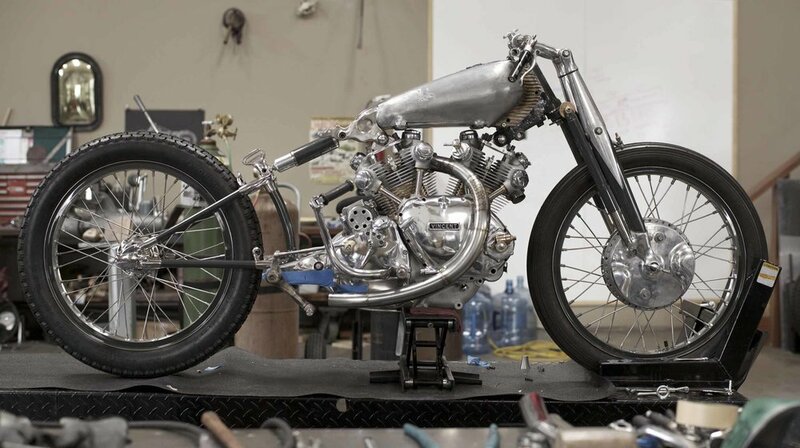 It was built for speed at a time now fetishized as a golden era, when obsessive amateurs labored nights and weekends to shave seconds from the timekeeper’s clock. 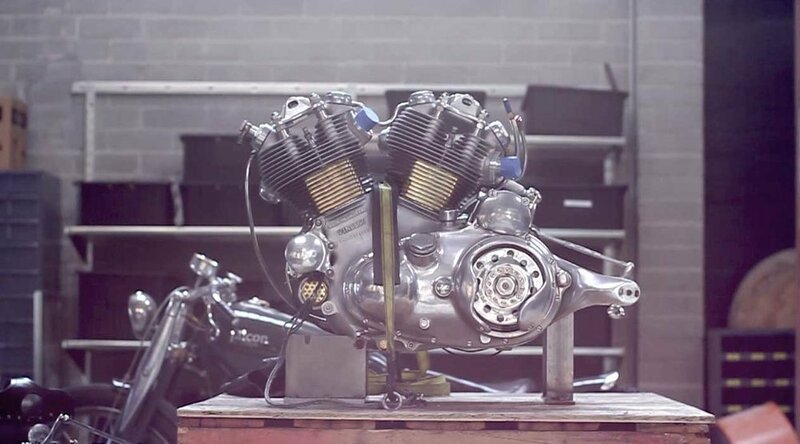 Barry purchased the Vincent engine in parts, to be modified once again. 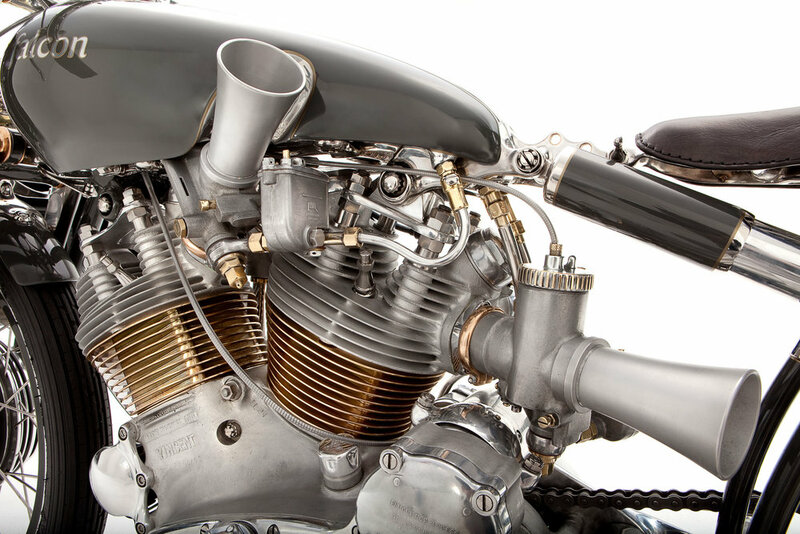 Complete analysis of all parts proceeded, and Ian collaborated with the world’s foremost Vincent expert, Herb Harris, on the engine. 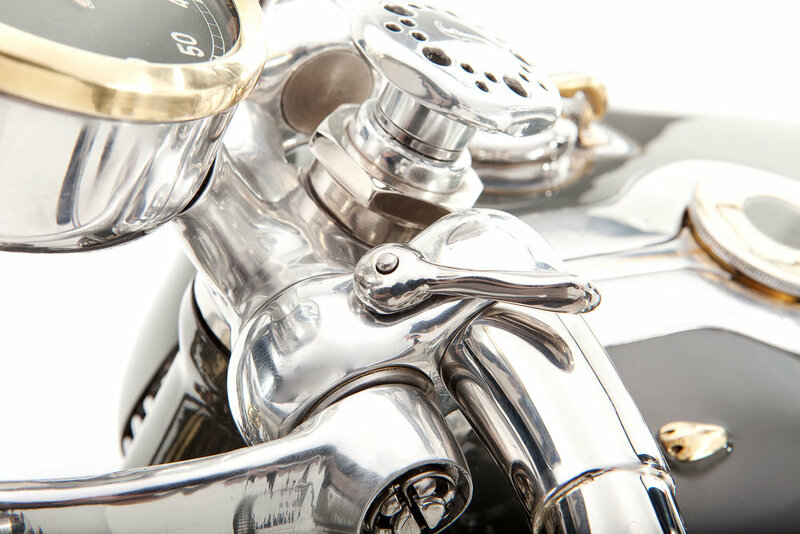 With the technological and industrial standards of the day, many of the Vincent’s parts were designed for ease of manufacture and cost efficiency—prioritizing certain parts and nearly forgetting others. 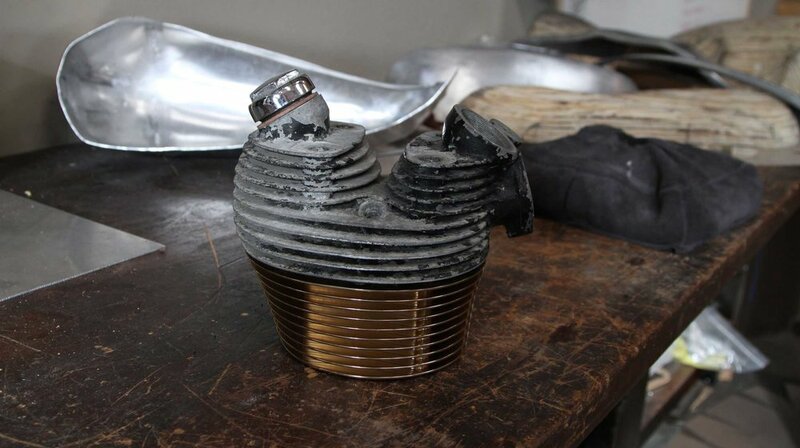 A cast lug at the top of the swingarm seemed peripheral, even trivial. For Barry, a total reinventing was vital. 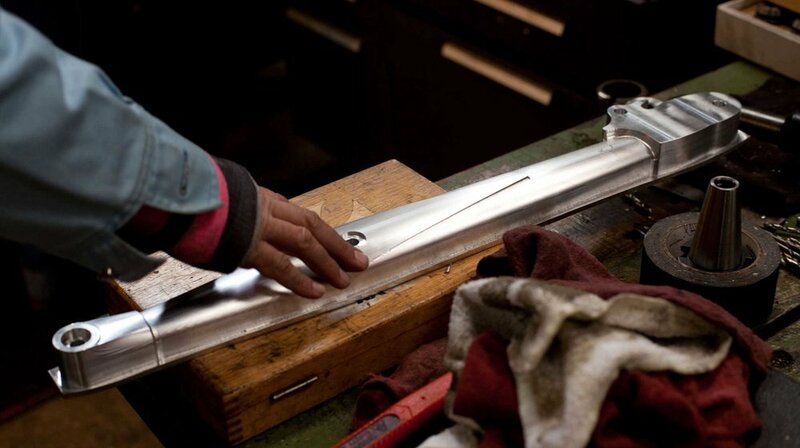 This disposable cast lug deserved to live—and to live with a lasting purpose and beauty. 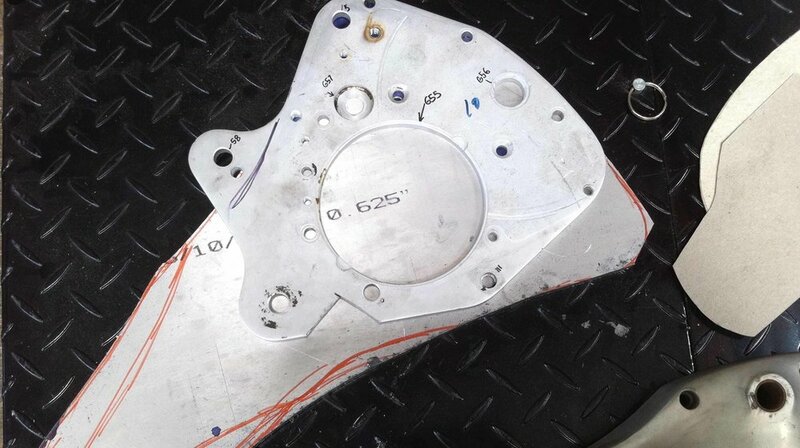 Envisioning a design too complex for 3-axis machine tools, Barry took a solid block of stainless steel and transformed it by hand, making a new lug resembling a diatom skeleton. 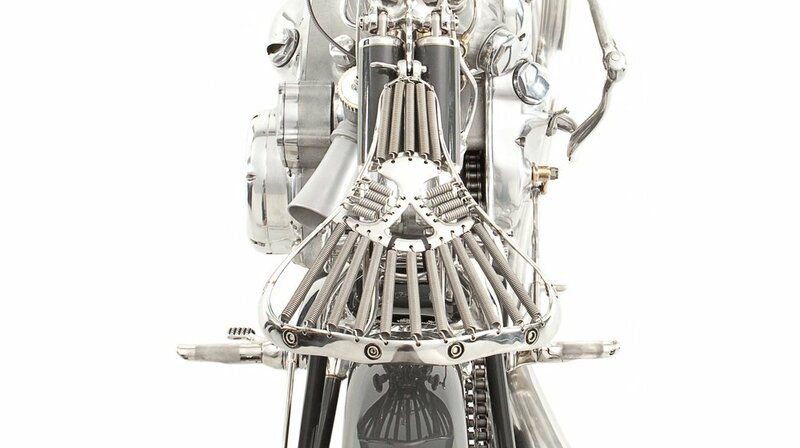 The Black's front suspension echoes the Vincent’s original ‘girdraulic’ fork while enhancing the performance and look. 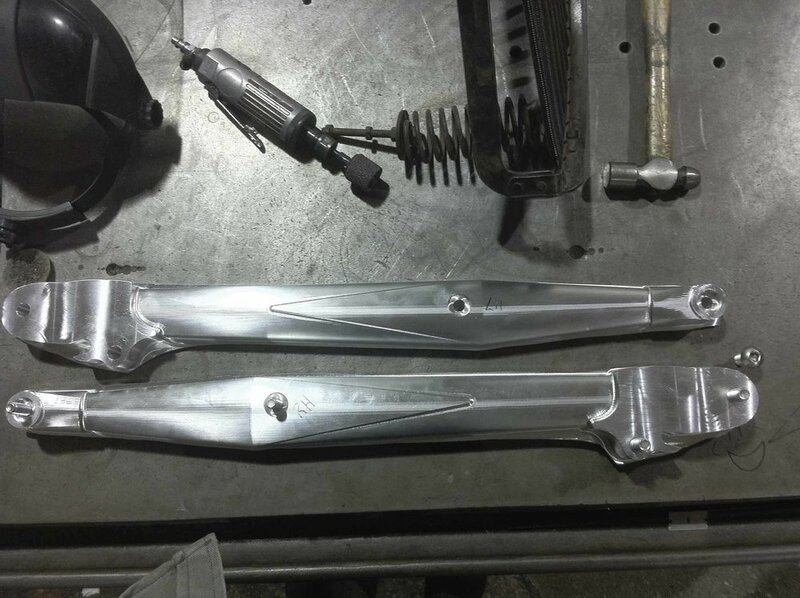 The forged 7075 T6 aluminum alloy blades have been hand-shaped. 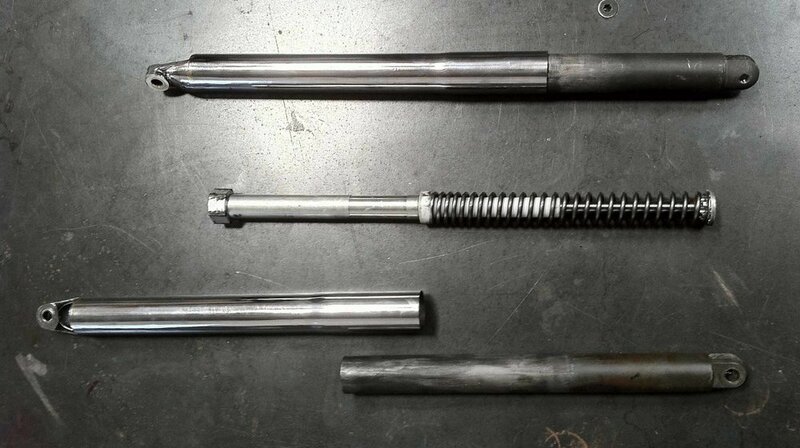 Additionally, the drag inherent in the bushed spindles has been eradicated using needle bearing throughout, controlling movement with bespoke gas shocks. 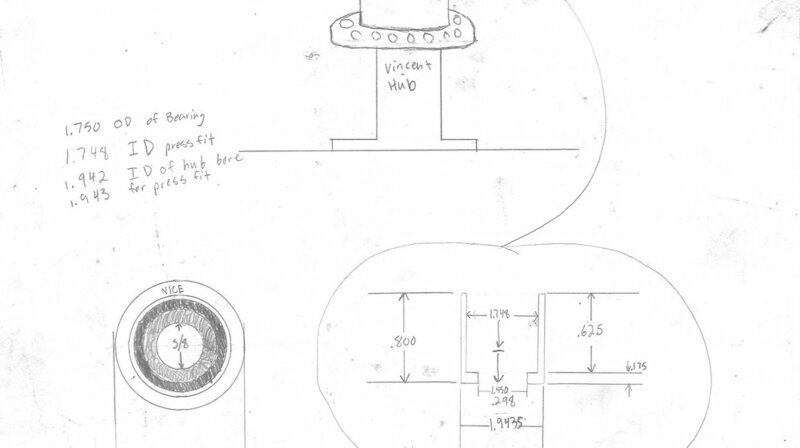 A castellated axle nut sits captive in its own hexagonal recess, locked in place by a cotter pin passing through the fork leg. 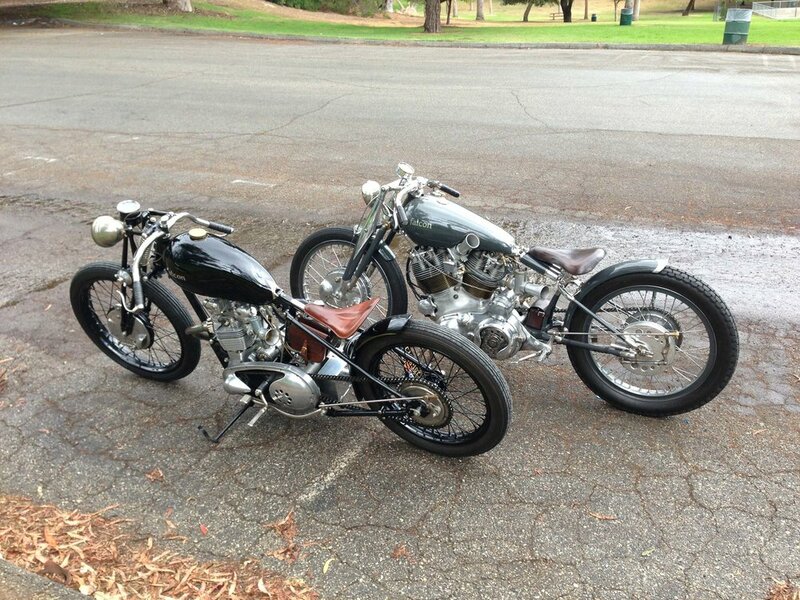 The fork spindle nuts are similarly locked, but with a kind of circlip, in a system Barry invented. 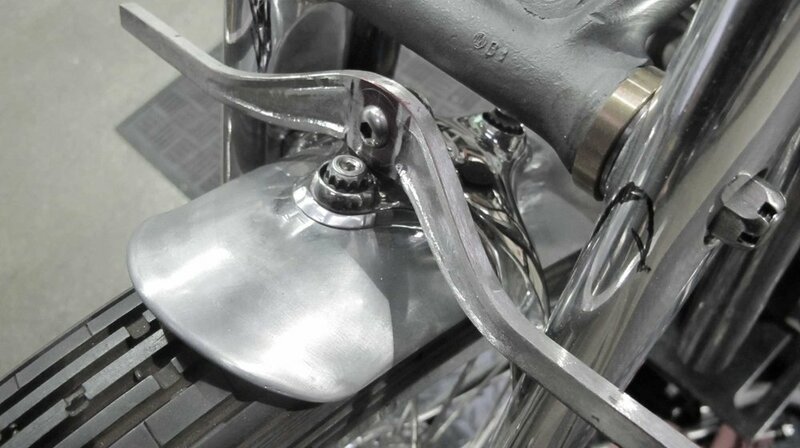 The handlebars are bent half-bars with tapered ends, fitted into risers poised atop the fork crown proper, grooved for secure locating—offering several adjustable fork positions. 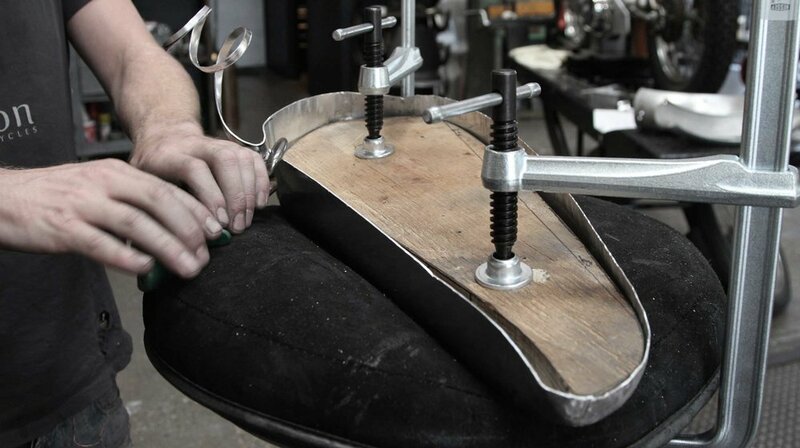 A tapered pin slides through the center of the risers, sliding into both sets of grooves, and when tightened, cinches all three tapers until the assembly is rocksolid. 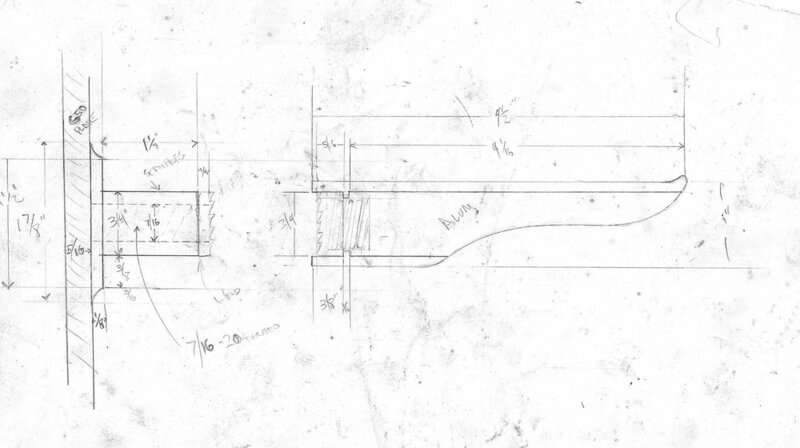 Two levers lock this assembly, remeniscent of dragonfly wings. 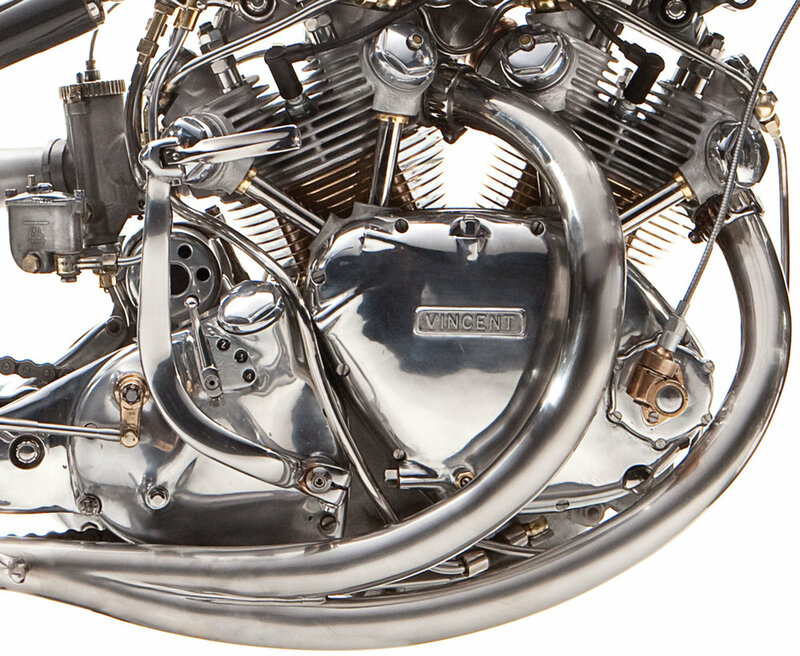 The 8-inch diameter front brake hub mimics the Vincent Black Lightning’s ribbed racing drums, but is made from a single mass of aluminum, and enlarged. 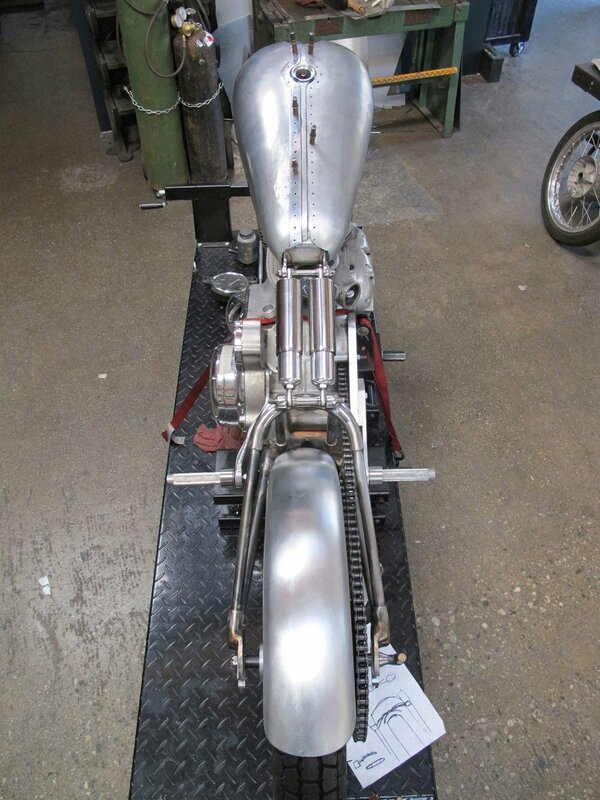 With mirror image brake plates each having twin leading shoes, this system is capable of halting a 150mph motion. 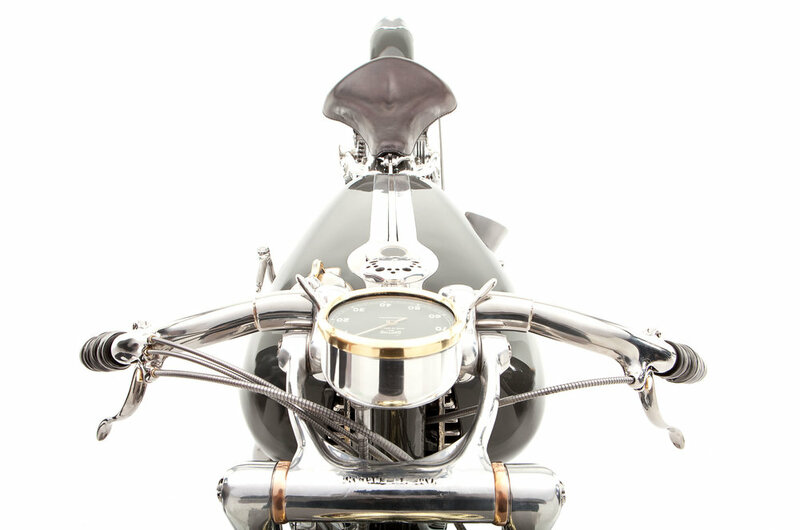 A 3-position seat with two leather covers, a drag racing option and touring option, snap onto the frame, and can be swapped in seconds. 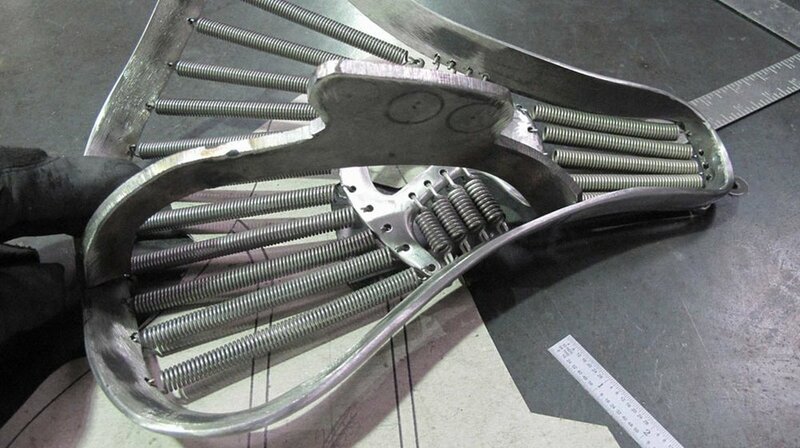 A stainless steel perimeter frame attaches to dozens of springs radiating from a central plate, guiding their shape into a concave arc, a seat-shape solution usually accomplished with padding. The Black can effortlessly shift from a 'touring' mode to a 'drag racing' stance. 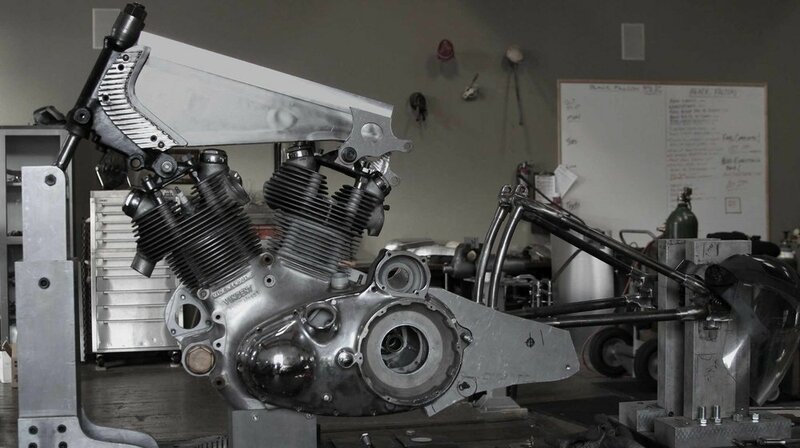 First, one locks the rear suspension with a pair of hand-wheels beneath the saddle, pops the marine-sourced fuel connections, pushes the spring-loaded tank retaining pins until they click, then the twin, hand-formed aluminum pannier fuel tanks are removed. 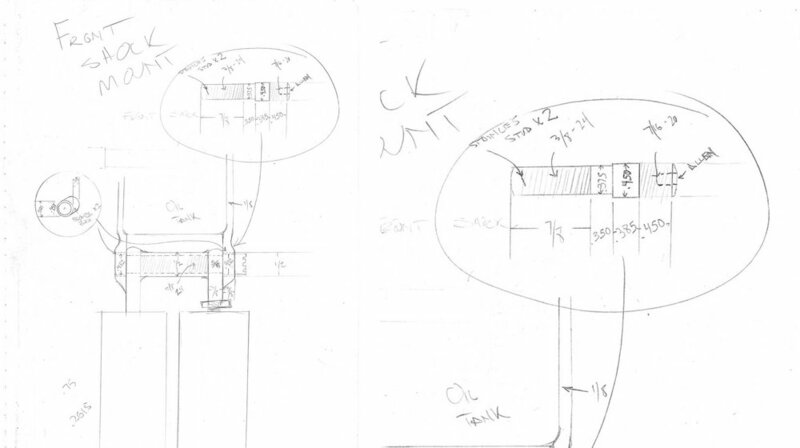 Reverse the procedure with the single drag tank option; push-click the tank onto the sprung pins, and pop the fuel lines together. 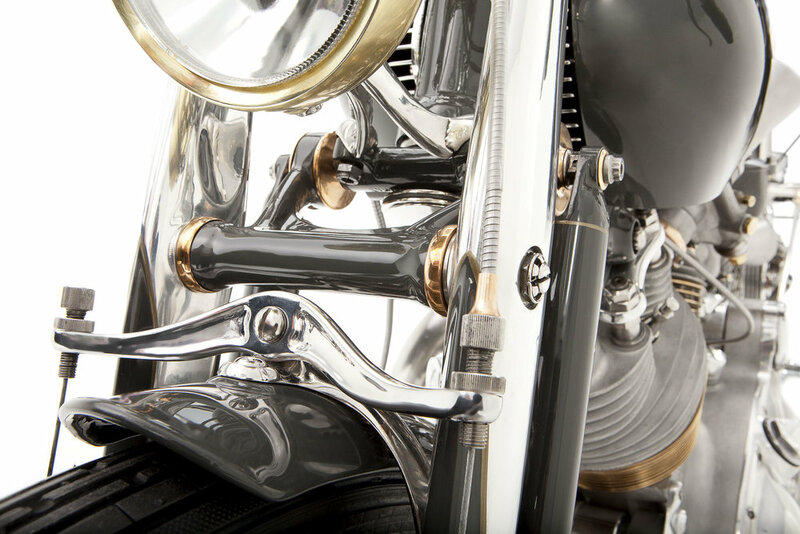 The handlebars can be adjusted to suit, as noted above, while the foot controls are also fully adjustable with the footrests rotating on one-way ratchets. By simply pulling outward, turning, and easing onto the mating surface, both the footbrake and gearshift levers are fully adjustable. 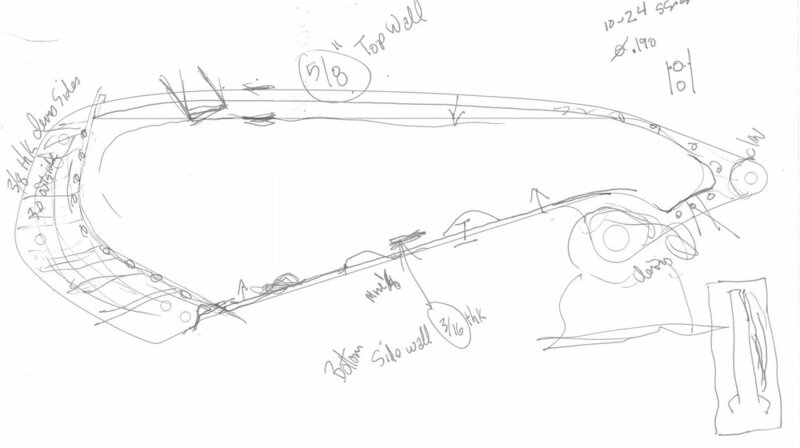 None of the above actions, is should be noted, requires a single tool.